The 2018/2019 SFES Spirit Rock is available for families to reserve and show their school spirit! Please reserve your date using this Signup Genius and then click here to return to the Spirit Rock page on our website to pay online. You can also send a check made out to "SFES PTO" with "Spirit Rock" in the notes section. Be sure include your name, your child's name, and your reserved date on your envelope to help us track your payment. **IMPORTANT**If you want the rock reserved on Wednesday, October 11th, please reserve the rock for Wednesday, October 11th. 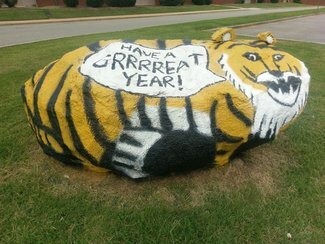 You may then paint the rock after 5pmon Tuesday, October 10thand will have it reserved through 5pmon Wednesday, October 11th. Please view our website for Spirit Rock Rules & Guidelines as well as Helpful Tips. We hope to see some rockin’ rocks!!! Thank you in advance for your cooperation and participation! PLEASE BE SURE TO CLICK THE "SUBMIT AND SIGN UP" BUTTON AT THE BOTTOM OF THE PAGE TO RESERVE YOUR DATE(S).